"Crossing the River in White Robes 白衣渡江 (bái yī dù jiāng)"
"When the clueless Lu Meng is under Wu Kingdom's nurturing, one must re-evaluate him in a different light. 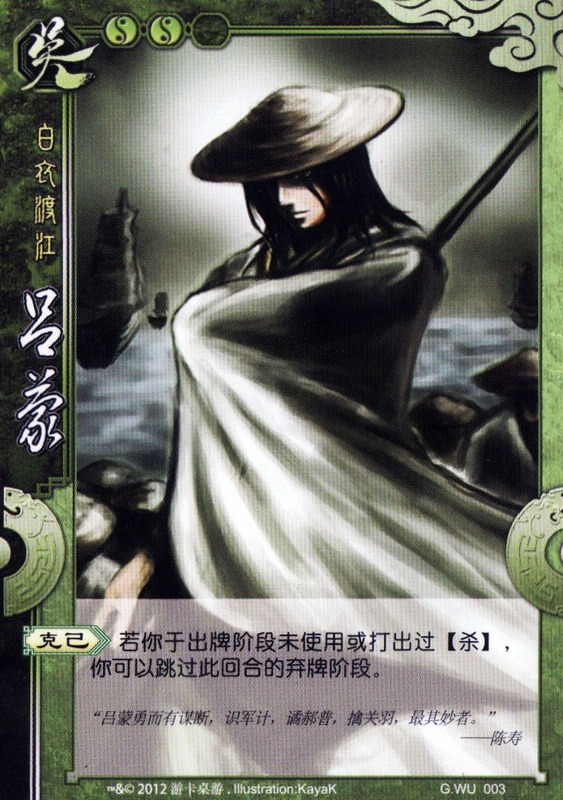 吴下阿蒙, 刮目相看"
Character ability: "Self-Mastery 克己 (kè jǐ)"
If you have not used or played ATTACK 杀 in your action phase, you can skip your discard phase for this turn. There appears to be two possible links for "Self-Mastery" to the story. This first is philosophical, where Lu Meng's diligence in his studies is a result of being able to master his time management and overcome his procrastination. He once complained to Sun Quan that he did not have time to read, but Sun Quan aptly replied that himself is busier than Lu Meng yet he can find the time to read. The second is directly related to the game ability. 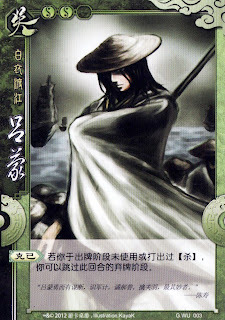 As displayed in the translated description, Lu Meng crossed a river in white robes for the purpose of deceiving Guan Yu 关羽's troops. Lu Meng's troops hid their weapons and pretended to be merchants (who were dressed in white in those days). Only at the last moment did they break their cover and surprise the enemy. This is indeed very similar to Lu Meng's game character! Always undercover and nondescript, but when he explodes he can be extremely lethal. If he use Attack for Duello, can he skip the discard phase?